The 1924-S Peace Silver Dollar had a mintage of just 1,728,000. The composition of these coins is 90% silver and 10% copper. 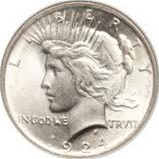 The diameter is of the Peace Silver Dollar is 38.1mm. There is a total of .077344 troy ounces of silver in each of these coins making them very popular with silver enthusiasts. The Denver and San Francisco mint mark is located above the tip of the eagles wings on the reverse. The Philadelphia mint coins did not have a mint mark. G4 Good - Date and letters readable. Main devices outlined, but lack details. VG7 Very Good - Major details discernible. Letters well formed but worn. F12 Fine - Hair ends distinguishable. Top hairlines show, but otherwise worn smooth. VF20 Very Fine - Hair in center shows some detail. Other details more bold. EF40 Extra Fine - Hair well defined but will show some wear. AU50 Almost Uncirculated - Slight trace of wear on tips of highest curls and breast feathers are usually weak. MS60 Uncirculated - No trace of wear. Light blemishes. The coin was as advertized and fast delivery. Great coin at a great price. Very pleased with the purchase.